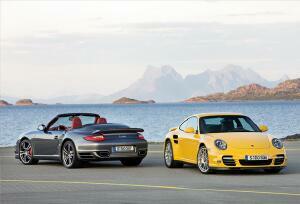 Porsche recently delivered the new 2010 911 Turbo to U. S. dealers. If that doesn't get our pulse moving and our thoughts to the days when we can enjoy our Porsches on snow- and salt-free roads, nothing will. Read about the new 911 Turbo, other news from Porsche and of course, the latest in news about the Milwaukee Region. We have a lot planned in the coming months, starting with February and shifting right through the calendar. We'll highlight some of the events on the horizon in this issue. Right around the corner is Historic Turbo Spaghetti on Feb. 6. If you haven't RSVP'd but want to attend, please call today to let us know you are coming -- 414-277-8108. Details here. Feb. 28 is the deadline to reserve a room at the White Gull Inn if you are planning to join the region's weekend in Door County Oct. 22- 23. You must call the White Gull to reserve your accommodations. If you wish to stay at another location, that's cool too. Details of the event here. March 19 -- Casual dinner at the Open Flame, Hales Corners. Hwy. 100 & Edgerton. This is a Friday night get together to say goodbye to winter and welcome spring. Order from the menu. The calendar says Spring starts on March 20. Whether or not the weather is in sync with that fact doesn't matter. Details here. April 30 -- The Milwaukee Region's 50th anniversary membership gathering at the Harley museum in Milwaukee, Event sponsor: Calibre. Bring your Porsche, park with other Porsches, mix and mingle. We'll have a very short program at 7:30 p.m. The rest of the night is pure fun dedicated to the celebration of Everything Porsche. Details here. June 12 -- Save the date for our region's annual Spring Tour. We'll be driving some great roads in the area and stopping for lunch. Details are being finalized. Stay tuned. The Fox Valley Region also extends an invitation to Milwaukee Region members to join in several of their events this year including a tour of state parks on June 6 and the FVR's 20th anniversary celebration at Trout Springs Winery on July 24. Hey ladies! The Fox Valley Region is hosting its second annual driving tour for women on June 12. Jump in your Porsche or grab the keys to the family Porsche and join this group of women who will drive to Door County for a day of fun. Details about the ladies driving tour are here. Registration opens March 9. Details here. You must register to attend Parade. The only events that are open to the public (and non-registered PCA members) is the concours d'elegance. The Milwaukee Region is not coordinating member participation. You must register on your own to take full advantage of this event sponsored by the national PCA organization. If you have not had the opportunity to attend Parade, the proximity of this year's event makes this year a great time to experience it. These members who joined the region in December have shared additional information about themselves and their passion for Porsche. Scott Pietila purchased his current Porsche, a 2004 Cayenne, in December 2009, having previously owned a 2000 Boxster. He said his pursuit of another Porsche included a comprehensive Internet search as well as scanning newspapers in Wisconsin and Illinois. His search was a success and he purchased his car from Napleton Porsche in Illinois. He was attracted to Porsche because of its quality as well as the history. "Porsche represents a lot of automotive tradition," Scott said. Scott is executive vice president at Associated Bag Company, a national supplier of packaging products and shipping supplies. Scott is looking forward to meeting other members during driving tours and social events. Geoff McLaughlin is the owner of a 1988 911 coupe as of his 50th birthday in November 2009. What a great way to celebrate this milestone! Geoff reports he got to drive the car for two days and then we got hit with 18 inches of snow. He admits to sneaking it out of the garage a few times after the snow subsided and the streets dried up. Geoff says he got the inspiration to buy a Porsche by accident. While waiting for his VW to be serviced at Concours Motors in Glendale, he test drove a "really nice looking Mercedes convertible." He drove it just for fun but in the back of his mind he knew he wanted what he calls a "play car." After driving the Mercedes, he knew it wasn't the car for him. Returning from the test drive, some used Porsches on the front row of the lot inspired him, but none of the cars in stock "lit my fuse," he said. "I especially liked the late 1980s 911 coupes," he said. So he started searching more seriously. He found his car on the Internet. It was at an Illinois dealer, coming out of an estate sale. As fate would have it, Geoff had a trip to Chicago already planned within two days of when he saw the Internet posting. He scheduled an appointment and a test drive. He made the deal the same day. Like the rest of us, Geoff likes Porsches for their engineering and aesthetics. With his kids almost grown, he figured now was as good a time as any to have one. A mechanical engineer, Geoff works at Milwaukee Valve. Art Maurer is the third owner of a 1980 911 SC that he purchased in 2009. He had been looking for a Porsche in the 1980 to 1989 era and knew of one in Racine. He negotiated with the owner for about four years before finally putting it in his garage. A vintage Corvette guy since the early '70s, Art has restored Vett's for years and still owns a 2004 Roadster but he always wanted a 911SC but could never find one that he could afford until now. "I love it," he said. "It is a totally different car than even the new Vetts." Art is a retired electrical contractor. He owned Maurer Electric for 30 of the 42 years of his career. He sold the business to Pieper Electric and worked as Pieper's Kenosha manager until he retired in 2009. Look for Art and his SC at our social events, tech sessions and driving tours. Porsche's 2010 911 Turbo, including a coupe and a cabriolet, is at a dealer near you. Read about it here and then go out and test drive one. Porsche says that the first six months of its fiscal year were encouraging. Read the details here. According to Automobile Magazine, the Porsche Boxster roadster and its hardtop sibling, the Cayman, are as close as a car company can get to the perfect everyday sports car. With fully optioned models climbing to $70K and beyond, the Boxster/Cayman isn't cheap, but buying one will allow you to achieve sports car nirvana, the magazine says. Our classifieds offer members a chance to buy and sell items of interest to others free of charge. Visit the classifieds page for details. 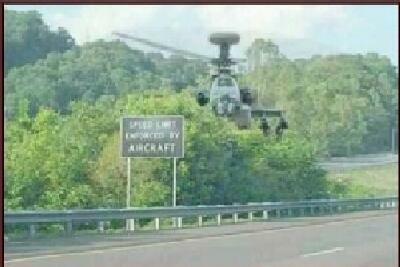 The road sign reads: Speed limit enforced by aircraft.